How Joey (Lieberman) Lost His Groove And Couldn't Get It Back : It's All Politics This issue of Political Junkie features the long decline in popularity of Sen. Joe Lieberman, the Connecticut independent who announced his retirement earlier this week. This edition of Political Junkie: The rise (and long fall) of Joe Lieberman ... a farewell to Sargent Shriver ... additional 2010 obits ... former Rep. Jay Rhodes (R-Ariz.) has died ... this week's Junkie segment on TOTN (and the trivia question)... the latest podcast ... and the return of ScuttleButton! Quite a busy week, with the announcement by Sen. Joe Lieberman (I-Conn.) that he's not going to run for re-election, the death of Sargent Shriver, and the debate on the House floor over a health care repeal. And I certainly can't omit what may have been the most eyebrow-raising incident of the week, the interview Sen. Harry Reid had on Tuesday with Nevada journalist Jon Ralston, in which the majority leader called Chinese President Hu Jintao "a dictator." Given the timing — Wednesday night was an official state dinner at the White House thrown by President Obama in Hu's honor — it seemed pretty, well, odd. All I can say is thank goodness we didn't have that wacky Sharron Angle in the Senate. You know how she always says outlandish things. Lots of things to talk about on this Friday, but I'm going to start with the decision of Lieberman, announced on Wednesday, not to seek a fifth term in Connecticut. I admit I was taken aback by the news. Yes, it would have been a tough race, as he acknowledged at his Stamford event, but all along he kept sounding like a candidate. Plus, as he also said, he's been in tough races before, like 1988 when he was not supposed to unseat GOP Sen. Lowell Weicker, or in 2006, when he lost the Democratic primary to Ned Lamont but went on to win as an independent in November. But something seems to have changed in Lieberman since that 2006 primary defeat, where he was abandoned by many of his longtime allies primarily because of his support for President Bush's Iraq war policy. By winning that year, he became the first senator in at least a half-century to be denied renomination and yet keep his seat (the second, Alaska's Lisa Murkowski, did so as a write-in candidate last year). It would probably be fair to say that his disillusionment with his own party came before his 2006 rejection. Remember, he was the Democratic nominee for vice president in 2000 — the first Jew to be on a major-party ticket — a ticket that won the popular vote. But Lieberman, as many vice-presidential nominees do, felt that the logical next step would be to seek the brass ring itself, and in 2004 he announced his candidacy for the White House. He was reportedly deeply hurt when Al Gore, his 2000 ticket mate, decided instead to endorse Howard Dean, the anti-war former governor of Vermont, for the nomination. Lieberman saw it as a betrayal. 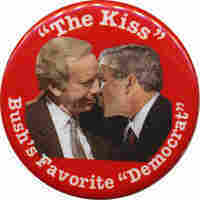 But Gore was not about to endorse a candidate who supported the war. As it was, Lieberman's bid went nowhere; he was out of the race by Feb. 3. The truth is, he most often voted with the Democrats, the party he stayed a part of, especially on domestic issues. Rumors that he was considering switching to the GOP were totally baseless. But his position on the war, followed by his endorsement of Republican presidential candidate John McCain and his denunciation of Democratic nominee Barack Obama at the 2008 GOP convention, were simply too much for Connecticut Democrats. He became their most despised person. Of course, Democratic divisions about Lieberman go back to at least 1998, when he gave an impassioned denunciation of President Clinton on the Senate floor over his dalliance with Monica Lewinsky. Some saw it as principled; others saw it as sanctimonious. Whatever, it was probably one of the reasons Gore selected him as his running mate in 2000: to illustrate he (Gore) could be his own man, declaring his independence from Clinton. And what about the Republicans? In 2006, they voted overwhelmingly for Lieberman. Back then, the inept GOP candidate, Alan Schlesinger, received less than ten percent of the vote. But that was a long time ago. Now, there is no indication of any GOP love for Lieberman at all, especially in the wake of his health care vote and successful pushing for the repeal of "don't ask, don't tell." So perhaps he just got sick of it all. The joy in his face, the impish sense of humor ... much of that was gone in the past several years. It was, in some respects, time to go. Lieberman's departure makes him the third senator to bid farewell in the past two weeks. The decision by Texas Republican Kay Bailey Hutchison to retire is similar to that of Lieberman's; the odds are that the incumbent party will keep those seats. The more interesting retirement is that of Sen. Kent Conrad (D-N.D.), which now moves that seat into the "lean Republican" category. The Hutchison and Conrad retirements were reviewed in Tuesday's Political Junkie column. It's too soon to handicap the Connecticut race, but my early guess for Democratic frontrunner is Rep. Chris Murphy (D-5th CD), who knocked off then-GOP Rep. Nancy Johnson in 2006. Susan Bysiewicz, the former secretary of state, jumped into the race on Wednesday, and some say Rep. Joe Courtney (D-2nd) might get in too. I'm sticking with Murphy as the eventual Dem nominee. On the Republican side, former wrestling executive Linda McMahon, who lost last year's Senate race to Richard Blumenthal (D) after spending some $50 million of her own money, says she's looking at another run. Others mentioned include former Rep. Rob Simmons, who lost the nomination to McMahon, and Tom Foley, who ran a strong race for governor in 2010. Sargent Shriver dies. Shriver, the first director of the Peace Corps, died Tuesday at age 95; he had long been suffering from Alzheimer's. A Kennedy brother-in-law — he married JFK's sister, Eunice — Sargent Shriver was a pretty amazing guy, with tons of energy that lasted late into his life. And yet, for all he accomplished — in addition to the Peace Corps, he headed up President Johnson's "War on Poverty" program as director of the Office of Economic Opportunity and later served as LBJ's ambassador to France — he was never successful in his own political career. His hopes of seeking the Illinois governorship in 1960 were dashed when Joseph Kennedy, the family patriarch, told him he couldn't run because he needed to help with John Kennedy's presidential effort. He was on the vice presidential short list in both 1964 (for Lyndon Johnson) and 1968 (for Hubert Humphrey), but the call never came. He also briefly was a candidate for governor of Maryland in 1970. The running mate phone call did come, in 1972, but under very odd (and for Democrats, painful) circumstances. Sen. George McGovern (D-S.D. ), the Democrats' presidential nominee, selected Sen. Tom Eagleton of Missouri as his running mate. But after the news leaked of his past psychiatric treatment for depression, Eagleton was forced off the ticket on July 31. Five days later, after a slew of Senate Democrats — Hubert Humphrey, Ted Kennedy, Abe Ribicoff and Ed Muskie — had turned him down, McGovern decided to pick Shriver. On Aug. 8, at a special meeting of the Democratic National Committee in the Sheraton Park hotel in Washington, it was made official. Nobody was going to defeat President Nixon that year, certainly not George McGovern. As it was, the McGovern-Shriver ticket lost 49 states in a landslide blowout, but Shriver got good reviews for his candidacy. And that led him to start thinking about four years down the road. With Ted Kennedy staying out of the '76 campaign, Shriver decided to run for president, laying claim to the "Kennedy legacy." But, as with many candidates with Kennedy connections — Ted Sorensen, Kenneth O'Donnell and Pierre Salinger come to mind — Shriver learned that the Kennedy mystique was not transferable. And voters saw him as a Kennedy relative without the Kennedy charisma. One of the last Democrats to get in the race, Shriver finished fifth in the Iowa caucuses, fifth in the New Hampshire primary and sixth in Massachusetts, and that was pretty much the end of his political career. When the family received word in 1964 that President Lyndon B. Johnson was considering Mr. Shriver as a running mate, Eunice balked. "No," she reportedly said, and then invoked her brother Robert's name. "It's Bob's turn." Kennedy aide Ken O'Donnell was more straightforward, telling Mr. Shriver that if any of the inner circle were to run, it would be Bobby - not "half a Kennedy." Despite his people skills, Mr. Shriver made a huge gaffe on the campaign trail while visiting a bar near a steel mill in Youngstown, Ohio. Locals ordered Pabsts, Schlitzes or Buds. Mr. Shriver called out, "Make mine a Courvoisier!" The Shrivers had five children, including Mark Shriver, a former member of the Maryland House of Delegates who lost a close bid for Congress in the 2002 Democratic primary to Chris Van Hollen; and Maria Shriver, the former NBC journalist who is married to ex-California Gov. Arnold Schwarzenegger. Eunice Kennedy Shriver died in August 2009. Hat Tip to Liz Toy, John Hiestand, Matthew Bray, Karen Long and Kevin Dessy. Jay Rhodes is gone. Word came in yesterday afternoon from my good friend, ex-Rep. Jack Buechner (R-Mo. ), that a former colleague of his, Arizona's John Rhodes III — known to everyone as Jay — has died. 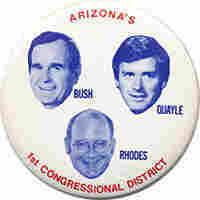 Rhodes, the son of former House Minority Leader John Rhodes, was elected to the House in 1986, replacing John McCain in the 1st District. A landslide winner three times, Rhodes was blindsided in 1992 by Democrat Sam Coppersmith and lost his seat. I got to know Rhodes quite well in recent years when he was president of the Association of Former Members of Congress. He was not a fan of the media, and was often quite cranky. But he had a wry sense of humor and was always good to me, and would often tell me some great stories about the time when his dad went to President Nixon, along with other members of Congress, in the last days before Nixon's resignation during the Watergate scandal. All of our conversations were off the record, but Jay promised me he would get them all into a book ... which he apparently never did. My observation was that Rhodes was not a natural campaigner, nor a natural politician. But he was a good guy, and I mourn his passing. Breaking News: Rep. Paul Ryan (R-Wis.), the chairman of the House Budget Committee, will give the Republican response to President Obama's State of the Union address on Tuesday. Talk of the Nation: This week's Political Junkie segment, which focused on the new Senate openings in Connecticut, North Dakota and Texas, can be heard here. Join host Neal Conan and me every Wednesday at 2 p.m. ET for the Junkie segment on TOTN, where you can often, but not always, find interesting conversation, useless trivia questions and sparkling jokes. And you can win a Political Junkie T-shirt! The podcast, which is recorded every Thursday, is completely archived. Click here to hear previous episodes. This Day In Political History: Sen. Robert Byrd of West Virginia upsets Sen. Ted Kennedy of Massachusetts for Kennedy's job as Senate majority whip. The vote is 31-24. There had been much criticism of Kennedy's performance as whip, with some saying he wasn't focused on the job, whereas Byrd was well regarded for his knowledge of Senate procedure. There was also some speculation that Kennedy's role in the Chappaquiddick incident — where a female companion in the car Kennedy was driving, Mary Jo Kopechne, drowned when the car went over a bridge in July 1969 — was a factor as well. Key to Byrd's decision to run: the proxy from Ga. Sen. Richard Russell, who was dying in a Washington hospital (Russell, in fact, died less than five hours after the Senate vote.) The result is thought to seriously damage the prospects of Kennedy seeking the presidency in 1972 (Jan. 21, 1971).